We are the GCM Charity Group derived and rooted through our Church TGCM. Our late Brother Ariel worked tremendously through charity runs and events such as Vitality London and BUPA London marathons. 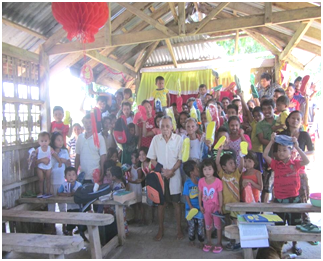 Moving forward, our main target at the moment is to reach out to the district of North Luzon in the Philippines to provide supplies such as school supplies for under privileged children in rural areas. We strive to work together as a church ministry and team to raise funds through various charity events and church engagements to be able to help people who need it, especially little children in the Philippines who are less fortunate; giving them a chance to accomplish their dreams and give them a solid future. We would like to actively carry on the legacy that the late Brother Ariel Alonzo left behind, in building the solid foundations to help the less fortunate through charity activities and campaigns. Currently, we have upcoming charity runs; the Vitality London 10K run in May 2018 and the Richmond Marathon also this summer. By raising money to sponsor the runners, we will not only aim to assist those in need, but to strengthen their chances of having a fruitful future as well as help build our ministries bond as a team to tackle poverty every little step at a time. We have been continuously blessed as a church and ministry in the past years so we would like to also share it and become a blessing to others by doing what we can to help and provide supplies for the less fortunate in our homeland the Philippines. Even just a small donation during the little food stall sales after the service on Sundays or even helping sponsoring those who will participate in the upcoming charity runs will make a difference to someone else needing it more than us.